The arrival of a new baby is, of course, a blissful event for parents. It is a wonderful time for grandparents too and, if given the chance, they can play a vital role in the upbringing of the infant. If grandparents live nearby, they may be able to see a lot of their grandchildren. Many will drop everything to take on babysitting duties, even at short notice, but stay-at-home dads should not take advantage of their willingness to oblige. Remember that grandparents have lives of their own to lead. Househusbands should make it clear to grandparents that it is okay for them to say no, as unless the occasional request is rejected, a dad will never really know when he is imposing by offloading the children. When grandparents are further afield, stay-at-home dads have a crucial role to play to make sure the grandchildren keep in touch. Even babies who can only gurgle in reply will enjoy and respond to the sound of a familiar voice on the telephone. Encourage grandparents to embrace new technology, as grandchildren will love to receive an email or text message. A webcam can allow Grandparents to see their Grandchildren as well as hear them, and so young children are less likely to be shy when they are reunited with Grannies and Grandads. Don’t forget older forms of communication either, and encourage any less technically-minded Grandparents to send postcards or little gifts through the post. Of course, parents and grandparents will not always agree when it comes to deciding what is best for the young child. Times change and certain methods employed by parents today will be foreign to grandparents. Househusbands should not be too sensitive if their childcare methods are called into question, as some of the less tactful grandparents may be only too willing to offer their opinions. If it becomes a problem, ask the grandparents not to give advice unless it is asked for, and remember that the final decision on what is best for the child has to be made by the parents. A stay-at-home dad should do what he can to help grandparents make their homes childproof. There is little point ensuring that every safety measure is taken at home if grandma’s house is a death trap. Encourage grandparents to carry out a safety check before a visit and make sure any valuable ornaments are well out of reach before letting the child loose. Take some toys and books to grandparents’ houses and make them different to those at home so that they seem special. Most grandparents will be happy to indulge their grandchildren and join in games, so parents can often take a welcome break. If grandma visits, she may even make the grandchildren breakfast and get them dressed, giving parents a precious lie-in. 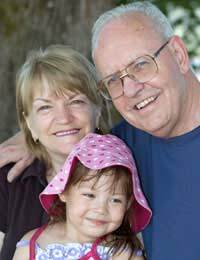 Remember too that grandparents are the family historians and can tell their grandchildren what life was like when they were young. Children will be keen to learn about the characters in the family album, so get grandparents to satisfy their curiosity. Most new grandparents these days are probably familiar with the idea of childproofing their houses for when the grandkids come to visit. Things will have moved on since they did it, but they'll gladly get up to speed (we did). Most of us grandparents are happy to share the load, and if it's a first child, our experience ion dealing with babies can be very useful (they don't come with a manual, after all! ).